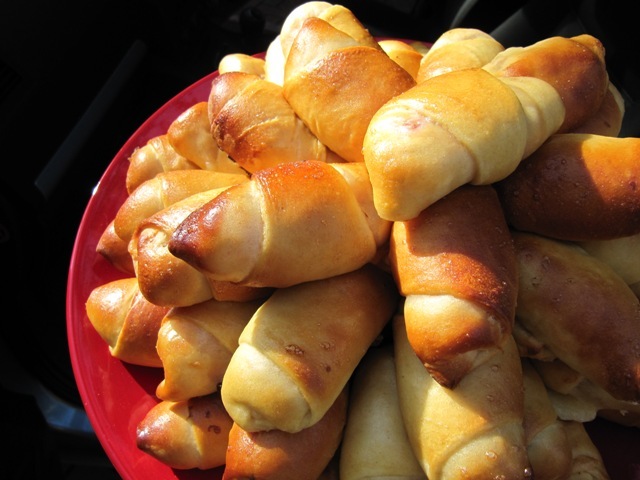 The list of things that make a Venezuelan expat homesick is long: family, the beach and the good weather, the Ávila hill (if s/he’s from Caracas), partying for no good reason, the easygoingness towards the law, cheap gas… But the very thing that we miss the most, even more than our own mothers, is a ham horn. The cachito, diminutive of horn, is a sweetish yeasted bread (though not terribly sweet) which is traditionally filled with minced ham. We never make it at home. We go to any of the countless bakeries in any corner of Venezuela, get a cachito and a coffee and have a lovely snack. I’m not sure about its origin. I presume it was the creation of some nameless Portuguese genius at some point in the early 20th century. For those of you unfamiliar with our history, a little context: at the end of the 19th century and during the first half of the 20th, Latin America received several migratory waves coming from Europe, mainly Spain, Portugal and Italy. In Venezuela, the Portuguese immigrants began to open bakeries (among other things), and they mixed the flavours of their homeland with ours. The result is wonderful, albeit little known abroad. Both savoury and sweet bakery in Venezuela are outstanding, if I may say so myself! 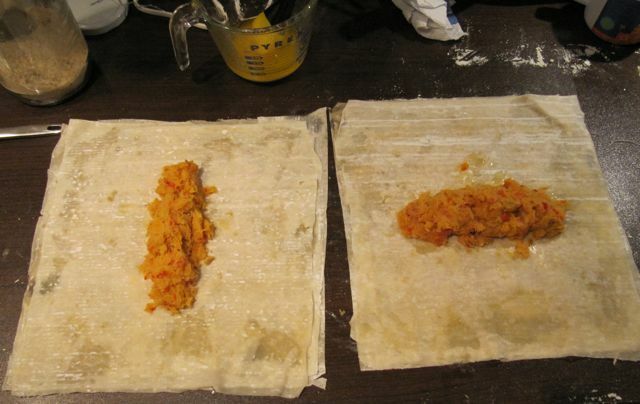 Here you have my personal recipe for cachitos, very close to the real deal you get in bakeries. 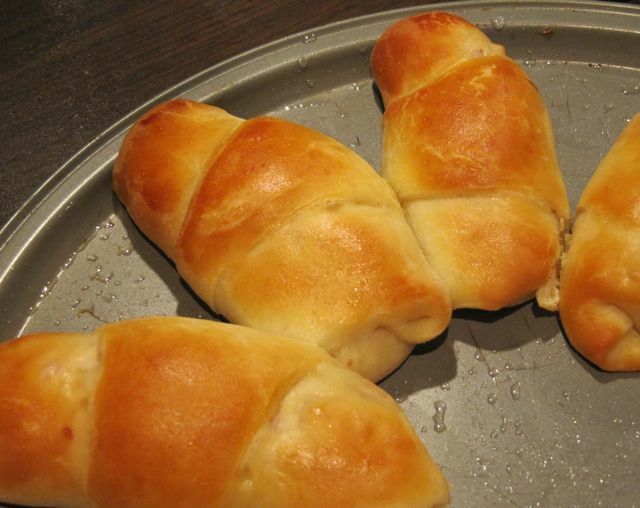 It looks lengthy, but they’re really easy to make. I hope you like it! 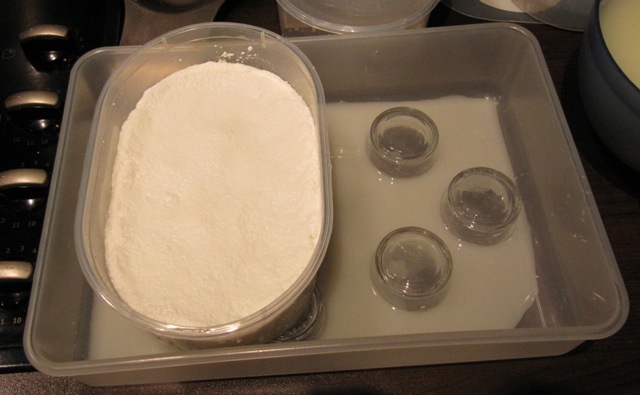 In order to activate the yeast, warm up ¼ cup of water and dissolve 1 tablespoon of the sugar. Sprinkle the yeast and stir to dissolve. Let it rest for 10-15 minutes until froth forms on top. Remember the water can’t be too hot as it kills the yeast. If the water and yeast mixture doesn’t form froth, it means the yeast doesn’t work. In a big bowl, lightly beat the two eggs until they are well blended. 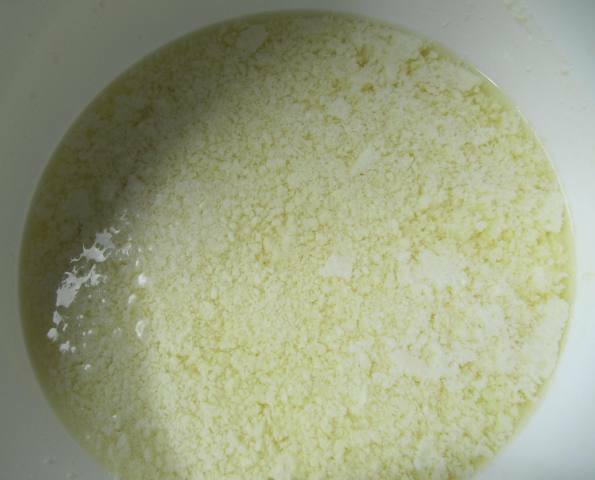 Add the milk, the rest of the sugar, melted butter (cooled down a bit so that the heat doesn’t cook the eggs) and salt. Mix in the yeasted water and add the flour one cup at a time, mixing really well (especially the first two cups) in order to dissolve any lumps. Once all the flour is added, you can either knead it using an electric blender with a kneading hook or by hand. 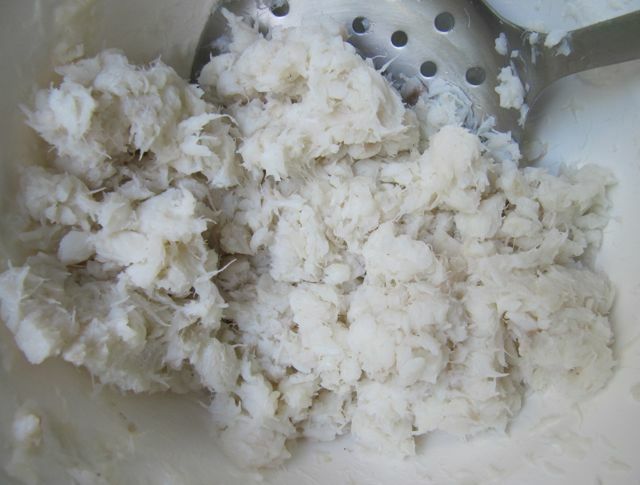 If using a blender, just leave the dough in the bowl and knead at low to medium speed for 5-8 minutes, until the dough is smooth and elastic. If by hand, dust the kitchen top with some flour and pour the dough. Knead it vigorously for 8-10 minutes or until you get a very smooth and elastic dough. You may need to add some more flour as you knead, but do it a spoonful at a time, so that the dough doesn’t dry up. 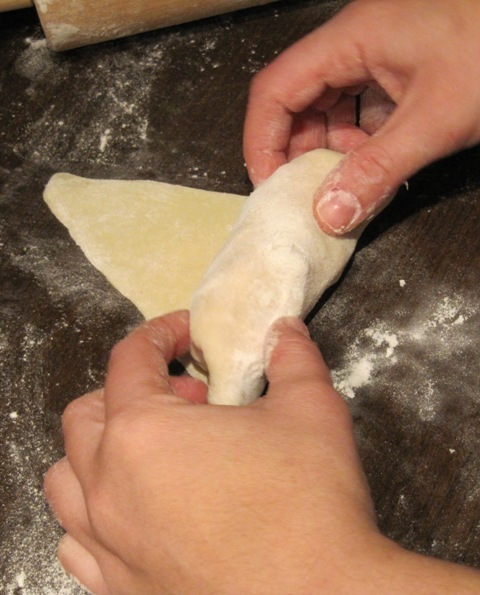 After some kneading, the dough shouldn’t stick to your fingers. The exact amount of flour depends on the brand you use (some are finer than others and tend to absorb more liquid), or on the size of the eggs. I usually use medium sized eggs, and end up using a bit over 4½ cups of flour. If, on the other hand, you notice the dough is too dry, just add a bit of milk. Once the dough is kneaded, put it back on a big (clean) bowl and cover it with a moist tea towel. Let it rest inside the oven (switched off!) for 1½-2 hours. The dough should double its size. It seems like a lot of time to wait, but you have to allow for the yeast to do its job. Don’t rush it and don’t add more yeast than what’s called for. 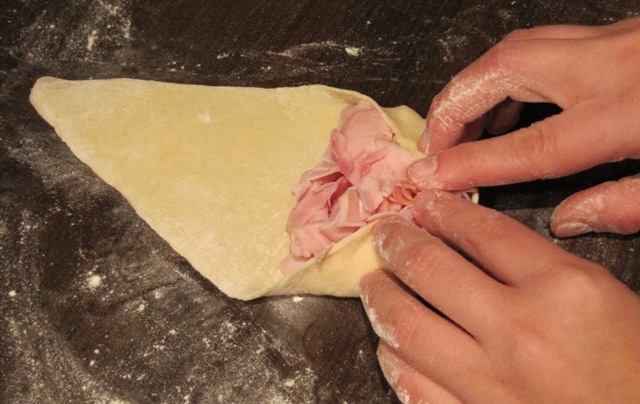 By allowing the dough to grow, you’ll get spongy and soft rolls. Once the dough doubles size, lightly dust the working surface and pour the dough back on the table. Using the tip of your fingers or your knuckles, gently punch the trapped air out until it’s back to its original size. 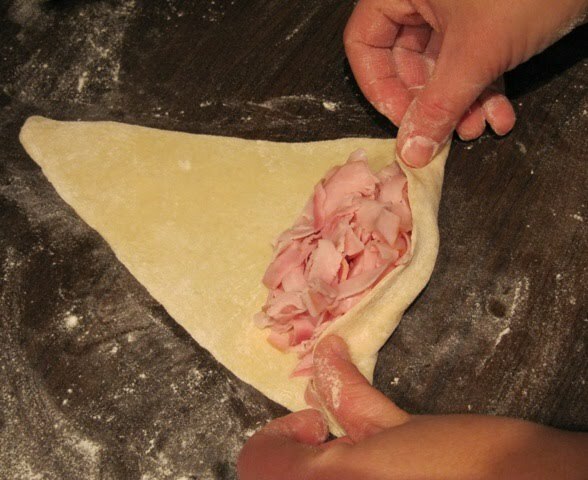 Make a flat disc with the dough and divide it in 4 equal portions using a sharp knife. 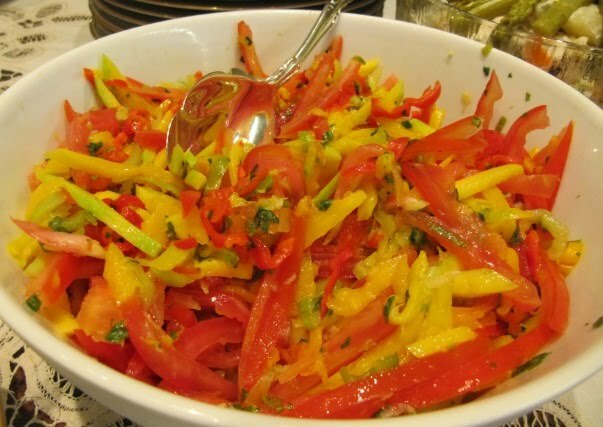 Work with one portion at a time. 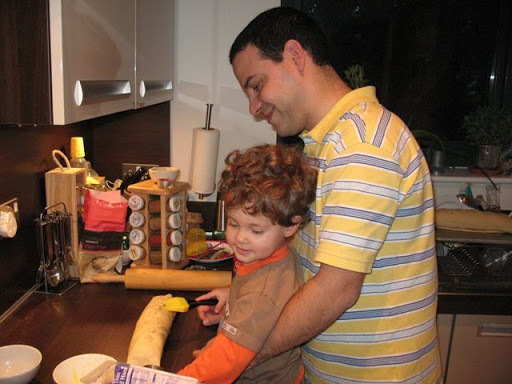 Try to make a nice round ball with the portion of dough and dust a rolling pin. Flatten the ball trying to keep a uniform round shape until it’s around 25-30 cm / 10-12 inches in diameter. Don’t worry if the circle isn’t perfect. The thickness of the dough is really up to you (you’ll get thinner but bigger cachitos, or smaller but more doughy ones). Just be careful not to thin them out too much, as they may break when you bake them. 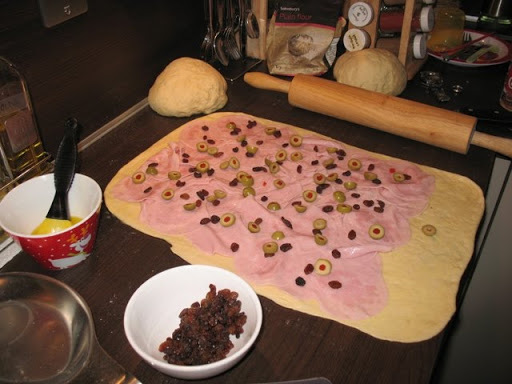 Once you flatten the dough, divide it in 8 portions using a sharp knife, as you would do with a pizza. Each triangle will be a cachito. 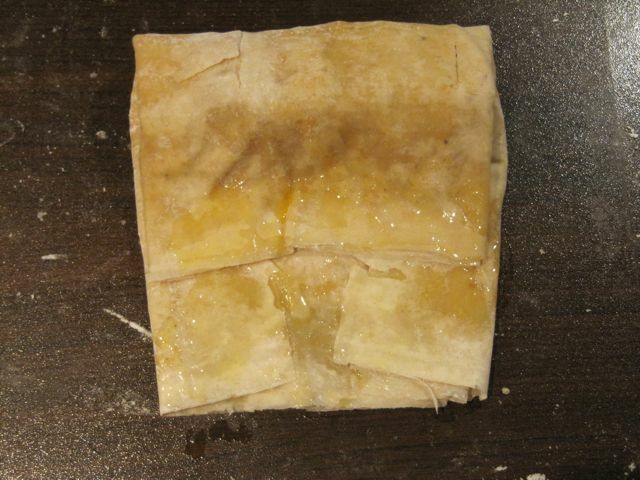 Usually you will need to flatten each triangle a bit more with the rolling pin before putting the filling. 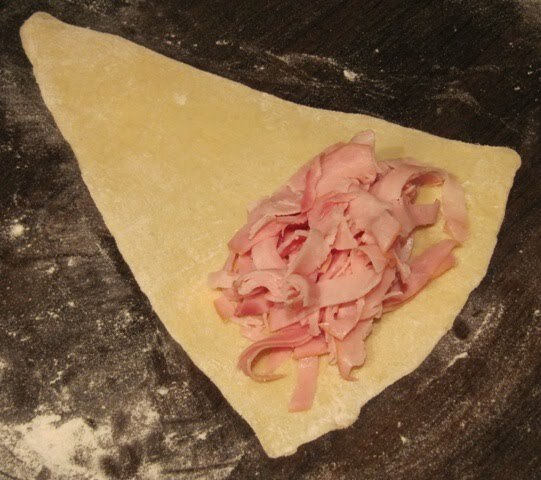 Before beginning to roll it up, fold the external borders of the triangle as if forming a pocket around the ham. 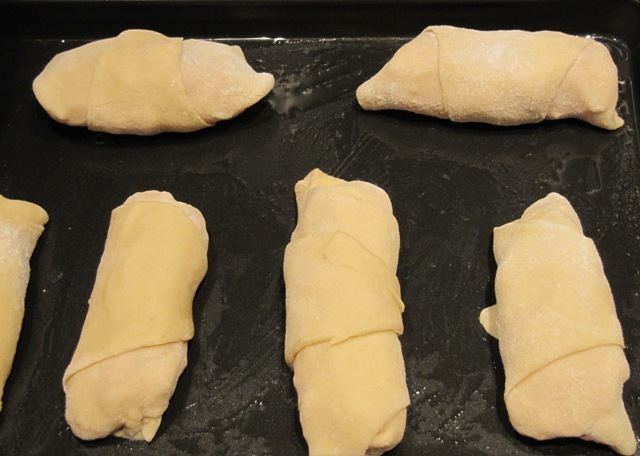 When placing the cachitos on a greased baking sheet, put the vertex facing down. 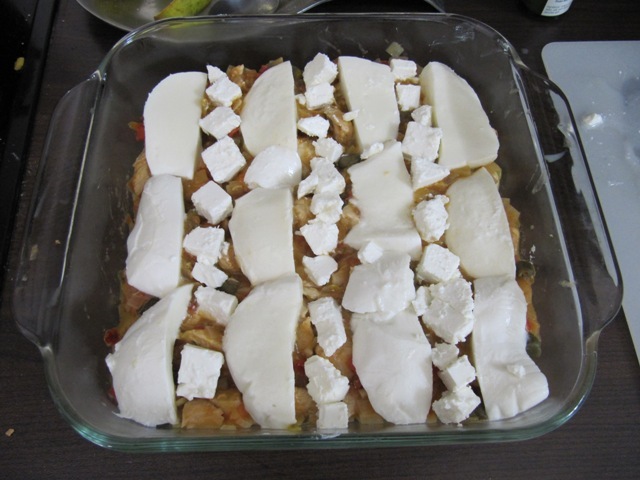 Leave enough space between each cachito, as they will grow considerably in the oven. 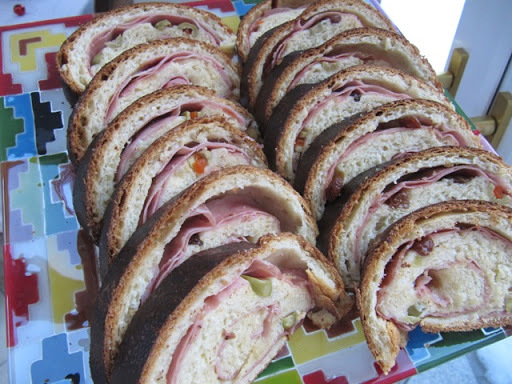 Originally, cachitos are only filled with minced ham, but there’s nothing wrong with experimenting a bit. A mixture of ham (say 600 g) and grated cheese (about 300 g, edam or a mild cheddar) are great together. 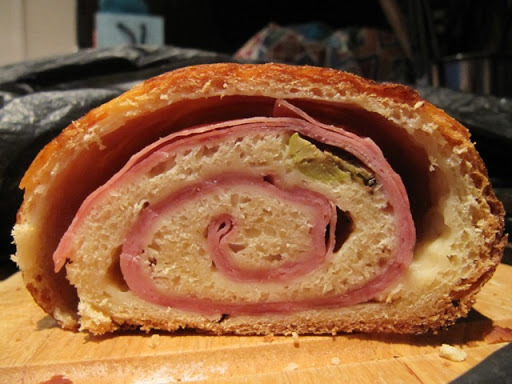 Another option is using turkey ham and softened cream cheese (since turkey ham tends to be dryer than pork ham, the cream cheese gives a nice extra moisture to the roll). When buying the ham, read the label and make sure to buy ham with added water (the other kind is way too dry and salty for this recipe). 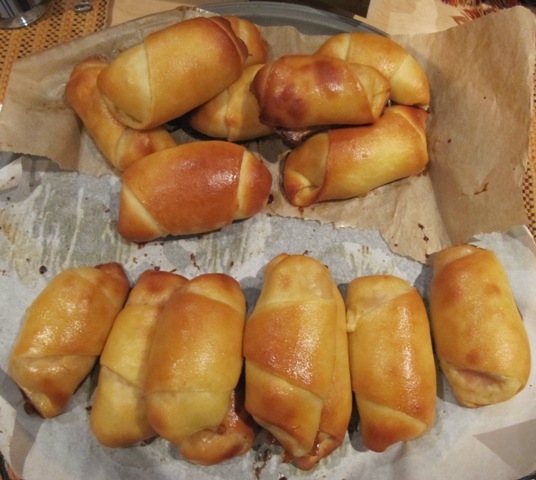 The first rolls always come out horrible, but you’ll get the hang of it soon enough! Once on the baking sheet, brush each cachito with a mixture of 1 beaten egg and 2 tablespoons of molasses. 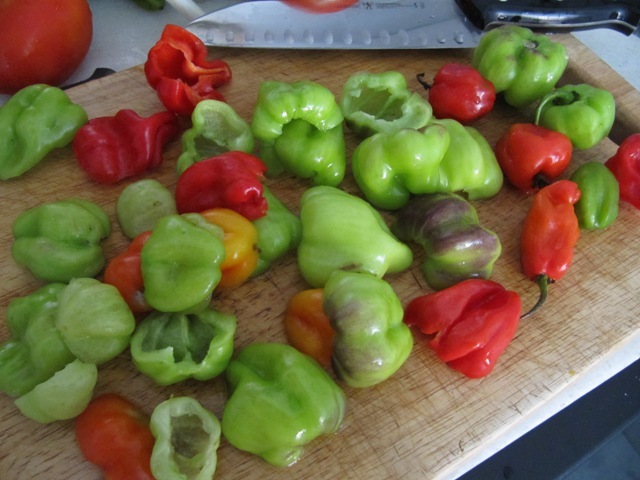 This will give them not only a nice golden colour (and avoid cracking), but also an extra sweetness. You’ll have some mixture left. Save it! 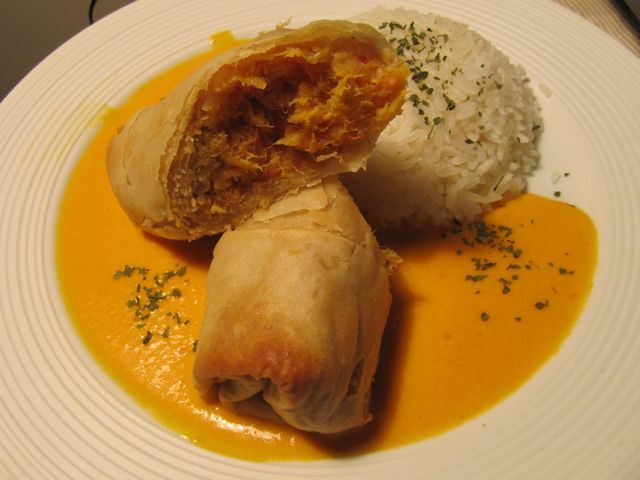 Let the cachitos rest for another hour in a warm place. Finding molasses is not hard. I’ve seen it sold in Tesco, but if you don’t want to buy a whole package just for this recipe, you can substitute it with muscovado sugar, which is type of dark and rich brown sugar. Preheat the oven at 175º C / 350º F. Right before putting the cachitos in the oven, give them a second brush with the egg and molasses mixture. 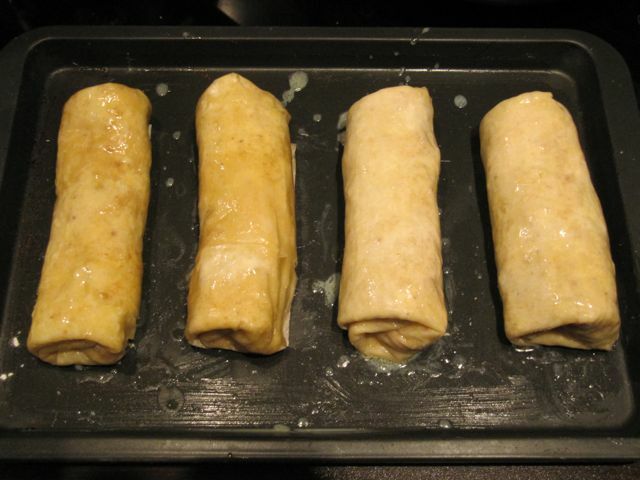 Bake them for 15 minutes in the middle of the oven, until they’re golden brown. 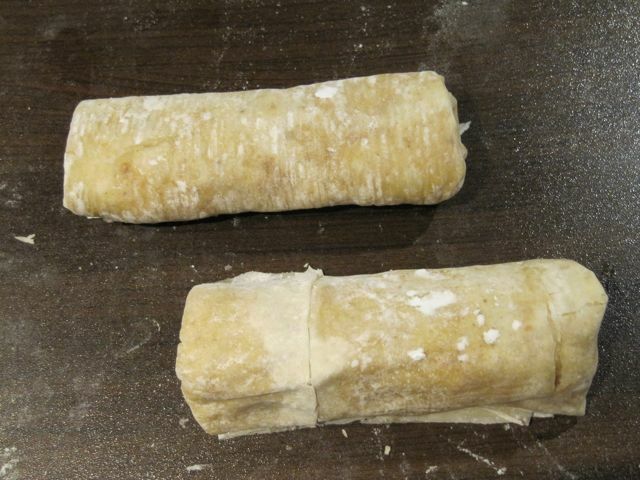 If 32 cachitos are too much, this dough can be frozen. 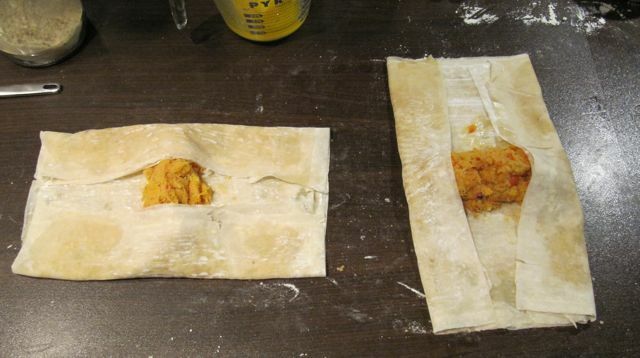 Once you punch the air out, put a few drops of oil inside a plastic bag, rub it a bit and place the dough inside. 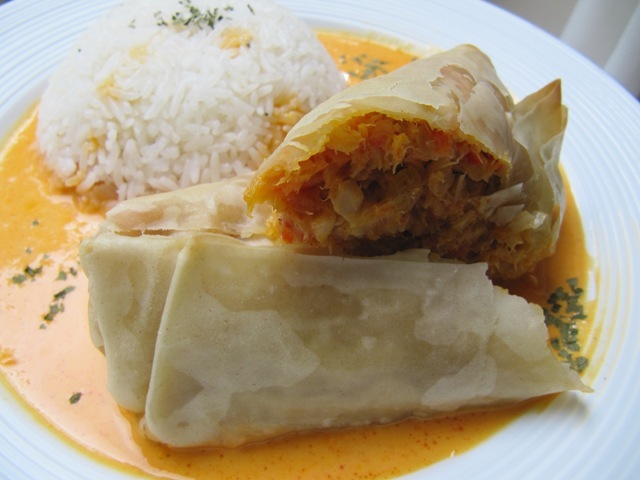 Close it tightly and freeze until you crave some cachitos again. When you thaw it, remember to open the bag or, preferably, put the dough in a bowl, as it will grow again (though maybe not as much as the first time). 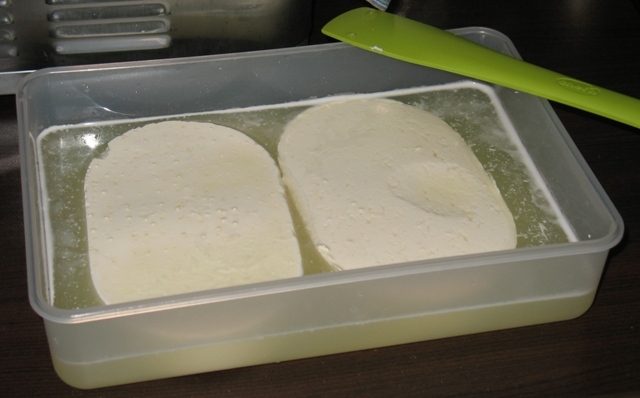 El otro día alguien me preguntaba cuál era la idea de hacer queso si hay tantos tipos buenos en el mercado, o si lo hacía porque extrañaba el queso blanco (fresco) venezolano. La verdad, en lo que respecta a la cocina, yo creo que todo tiene sustituto (o algo bastante cercano que sirve igual). Es cierto que los quesos frescos en Venezuela son espectaculares (paisa, guayanés, de mano, telita, llanero, etc. ), y que no se consiguen equivalentes en la mayoría de los casos. 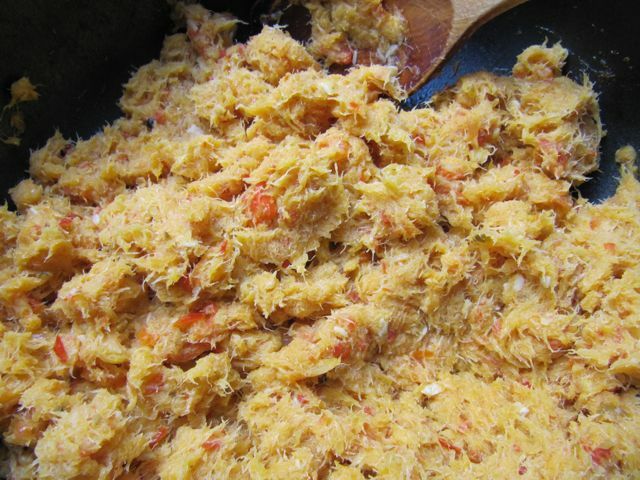 También es cierto que buena parte del sabor (y textura) de muchos platos criollos está precisamente en el queso, pero mi motivación para hacerlo (o intentar) en casa, no sale de la nostalgia, sino de la mortificación. A mí me desespera no saber cómo hacer las cosas, la inutilidad urbana. Esa incapacidad cómoda que nos ha llevado a perder la curiosidad, a no cuestionar las cosas más básicas. ¿Cómo se hace el jabón? ¿Qué tiene la pasta de diente? ¿Cómo se esteriliza un frasco? ¿Cómo se extrae el aceite de una aceituna? ¿Cómo se despieza un pollo? No tiene que ver con costo, porque usualmente este tipo de cosas sale más caro hecho en casa que comprado. No es cuestión de calidad, porque hay que ensayar y errar bastaaaaante antes de que el producto sea medianamente decente, así que no se trata de convertirse en expertos. 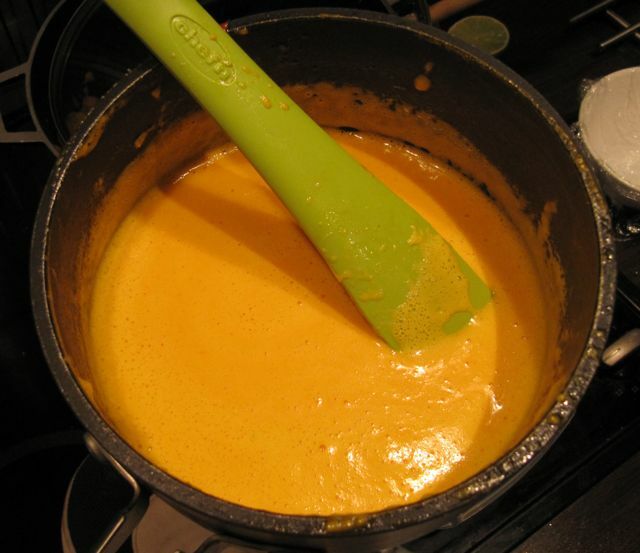 Supongo que hay un componente de soberbia: quiero aprender a hacer queso porque puedo. 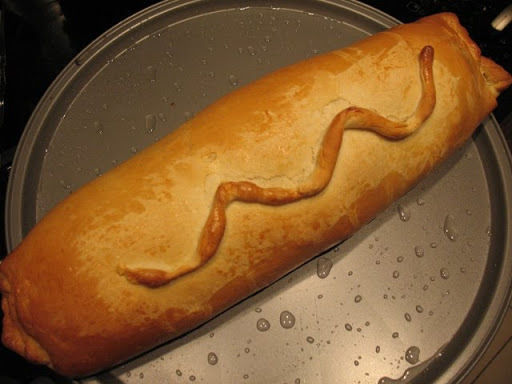 Hay una satisfacción extraña cuando uno mismo hornea un buen pan, cuando cosecha algo que tiene meses cuidando y regando, o cuando hace un postre que creía imposible de preparar. Con esta mortificación en la cabeza, un día me puse a buscar recetas en internet. 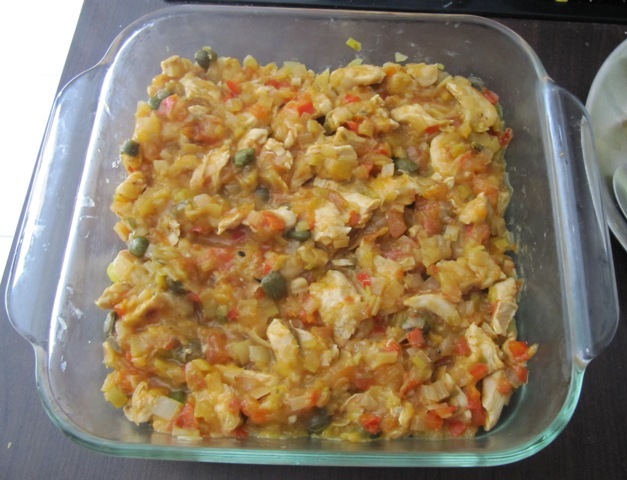 Lo que les paso aquí es una receta-compilación. Hacer quesos es toda una ciencia, y todavía me falta muchísimo por aprender, pero por ahora éste es el resultado (y mis tips de amateur). Para hacer queso, hay que cuidar muchos detalles: primero, la higiene. Todo tiene que estar impecable (ollas, utensilios, manos). Esto parece obvio pero es importante decirlo en voz alta porque cualquier partícula o sucio fuera de su sitio puede arruinar el queso. Lo segundo, la temperatura. Si está muy alta, se quema la leche. Si está muy baja, no cuaja la leche. Tercero, el tipo de leche que se utilice: puede ser de vaca, de cabra, de oveja. Lo único es que no puede ser ultrapasteurizada porque no coagula (de hecho, hay quieres dicen que tampoco debería hacerse con leche pasteurizada, pero vayan ustedes a conseguir leche “cruda” en medio de la ciudad…). 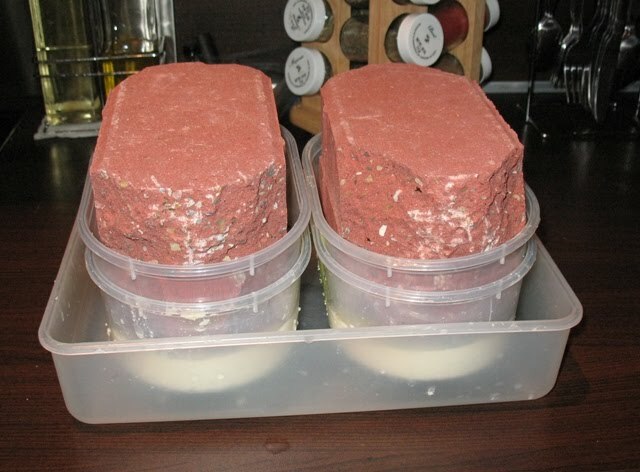 Ahora, sobre las cantidades: con 4 litros de leche, salen esos dos quesos que ven en la foto de arriba (tal vez de unos 200-250 g cada uno -no los he pesado). Creo que el cálculo estándar es que por cada 5 litros de leche sale 1 kilo de queso, pero esto es un poco optimista, en mi opinión. Lo que ven abajo en la foto es nuestro cincho casero. Utilizamos 4 potes de helado Carte D’Or, dos de las tapas, cuatro ladrillos (que compramos en cualquier tienda de construcción, tipo Epa, Home Depot, Homebase, etc. ), un tupper rectangular (suficientemente grande como para que quepan los potes de helado) y 6-8 vasitos para velas de Ikea. En los potes de helado que van abajo se pone la cuajada y están todos agujereados en la base y en los costados, para que el suero salga fácilmente. Abrí los huequitos con taladro y una mecha fina (los huecos no pueden ser demasiado pequeños porque la cuajada los bloquea, pero tampoco demasiado grandes porque se sale). Recorté dos de las tapas, quitándoles el borde, de modo que cupieran perfectamente dentro del pote y funcionaran como base para los potes que van arriba, que sirven, a su vez, para contener los ladrillos (a éstos no hay que abrirles huecos). Los ladrillos, por su parte, son rectangulares y no caben dentro de los potes, así que Hugo compró un cincel y los moldeó para que cupieran. 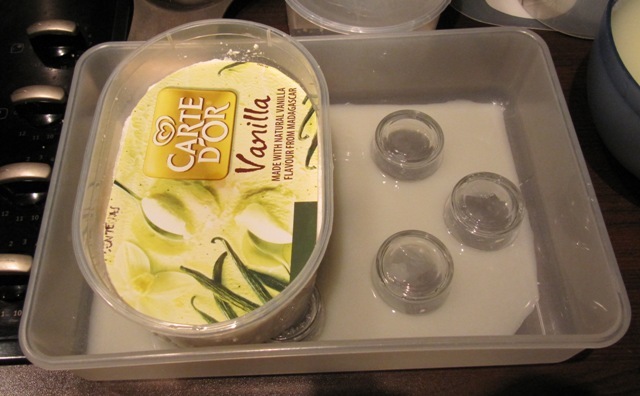 Los portavelas de Ikea (no se rían) sirven para elevar los potes de helado mientras escurren el exceso de suero en el tupper grande. Si tiene alguna rejilla también sirve. 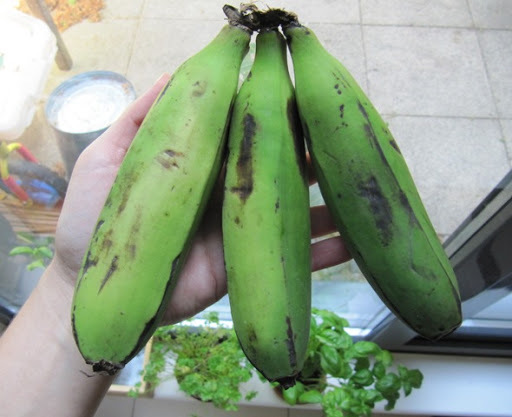 Yo prefiero usar estos vasitos porque los puedo esterilizar más fácil que una rejilla (y tienen que estar limpios, porque ese suero que bota la cuajada sirve luego para hacer ricotta o para salar los quesos). En una olla grande, preferiblemente de fondo grueso, mezclar la leche con el yogur o cultivo láctico y calentar a 40º C /104º F (un poco más elevada que la temperatura corporal). Hacerlo a fuego lento, para que no se queme la leche (sí, se demora un montón, pero es preferible tener paciencia que perder toda la leche). Deberían pasar al menos 30-40 minutos antes de ponerle el cuajo o el ácido. ¿Qué es el cultivo láctico? Un poquito de suero que tengan de un intento previo, o algo que le dé un toque ácido a la leche (como el yogur natural). En alguna página leí que la persona no le ponía nada de esto, sino que usaba leche que tuviera ya al menos dos días en la nevera. Esto ayuda a acelerar el proceso de cortar la leche, pero no necesariamente tienen que incluirlo. Cuando ya la leche llegue a la temperatura deseada, retirar del fuego y echarle el cuajo o rennet, o el vinagre blanco o limón. Si no tienen termómetro de cocina, pueden medir la temperatura con el dedo (limpio). Debe sentirse un poco más tibia que la temperatura corporal. ¿Qué diferencia hay entre usar cuajo, vinagre o limón? Bueno, en mi opinión inexperta, el cuajo es mucho más eficiente para cortar la leche y formar la cuajada. El problema es que no es fácil de conseguir. 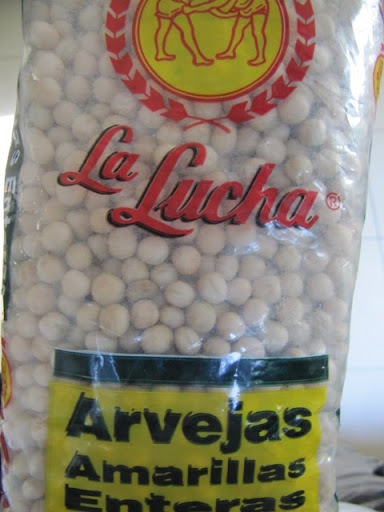 El que tengo me lo consiguió mi tío Luife, montuno de pura cepa, y lo compró quién sabe en qué agropecuaria en Venezuela. Lo más fácil es usar limón o vinagre. Yo, en lo personal, prefiero el vinagre porque corta más rápido que el limón. Si usan cuajo, sigan las instrucciones del paquete: usualmente hay que disolverlo en un poquito de agua fría, agregarlo a la leche y revolver bien por un par de minutos. Nunca he usado rennet (hay en polvo o líquido), que es la alternativa más frecuente. Dejar reposar la leche por unos 40 minutos hasta que cuaje. Pasado este tiempo, la leche debería tener una textura gelatinosa. Usando un cuchillo largo y afilado, cortar la cuajada haciendo líneas paralelas de unos 5 cm de grosor, y luego líneas perpendiculares (también de 5 cm), pero inclinando el cuchillo diagonalmente. Esperar 10-15 minutos, y cortar nuevamente cada cuadro por la mitad. Recuerden inclinar el cuchillo para que la cuajada también se corte por abajo. Repetir esto hasta que la cuajada ya esté del tamaño de granos pequeños. La idea de estos cortes es que la cuajada vaya botando todo el suero. Con las manos limpias, hundir suavemente toda la cuajada al fondo de la olla y luego quitar suero con cuidado (guardarlo aparte). Troubleshooting: en teoría la cuajada debería estar suficientemente sólida como para que se mantenga en el fondo de la olla mientras se drena el suero, pero en mi experiencia, siempre es necesario usar un colador (MUY fino) para retener algunos trocitos y que el suero salga limpio. Ahora fíjense en el color del suero: si está muy blanco, quiere decir que todavía le quedan sólidos. Dos opciones: calentarlo otra vez, echarle un poquito más de limón o vinagre y cortar de nuevo. O reservar para hacer ricotta (la receta está más abajo). Si el suero está amarillo o verdoso, ya no se le puede sacar más sólidos, pero no lo boten. Tiene varios usos que explico más abajo. Pasar la cuajada a los moldes y dejar reposar sin presionar por 2 horas. Recuerden poner los moldes sobre una rejilla (o sobre los portavelas), metidos dentro de un recipiente, porque la cuajada va a seguir botando suero. Después de este tiempo, poner las pesas sobre la cuajada (livianas para un queso más suave y poroso, pesadas para un queso más firme y compacto). Un meollo culinario: hay gente que dice que las pesas deberían dejarse por 18-24 horas, pero otros dicen que mejor por 2-3 días. Aquí en Dublín, en invierno, mi cocina es bastante fría y no me importa dejar el queso afuera toda una noche prensándose, pero si están en un sitio más caliente, les recomiendo abrir espacio en la nevera y prensar ahí para que el queso no se vaya a dañar. Honestamente, nunca lo he dejado más de 36 horas prensándose, y siempre sale un queso compacto, pero no duro. Hagan la prueba a ver cómo les gusta más. La regla general es que mientras más compacto, quiere decir que tiene menos suero, con lo cual dura mucho más tiempo. Recuerden de todas maneras que éste es un queso casero, súper fresco y sin aditivos, así que no dura tanto como un queso comercial. 1) Echarle la sal a la cuajada antes de prensarla. 3) Poner las panelas de queso en salmuera (por cada litro de agua o suero que se usa, se pone 18% de sal (18 g). Mi experiencia: una vez salé la cuajada y quedó bastante bien. Otra vez froté los quesos y no me gustó mucho porque la panela no absorbió bien, así que había partes saladas y otras sosas. Y, como pueden ver en la foto de abajo, también he usado la técnica de la salmuera, pero tiene un problema: el tiempo. Si se deja poco tiempo, el queso no absorbe bien la sal, pero si se deja demasiado, puede llegar a quedar incomible. He leído que se debe dejar 10 minutos por lado, pero también he leído 12 horas por lado. Ya ven la diferencia abismal. Creo que la vez que mejor me ha quedado, usando la proporción del 18%, es dejando el queso 1/2 hora por lado. ¿Qué hacer con el suero que sobra? 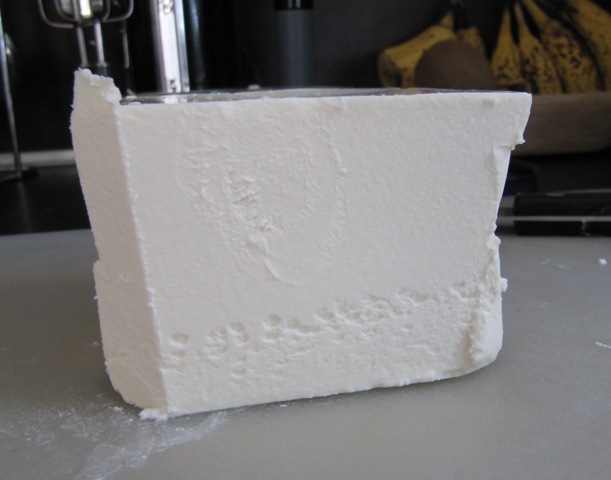 Se puede hacer ricotta (requesón), se puede guardar un poquito como cultivo láctico para la próxima vez que se haga queso, o se puede hacer un pan integral. Como escribí arriba, si el suero queda blanquecino, se puede poner nuevamente en la olla y llevar a un hervor suave por unos 30 minutos. En este tiempo debería formarse más cuajada. Ésta es la ricotta. 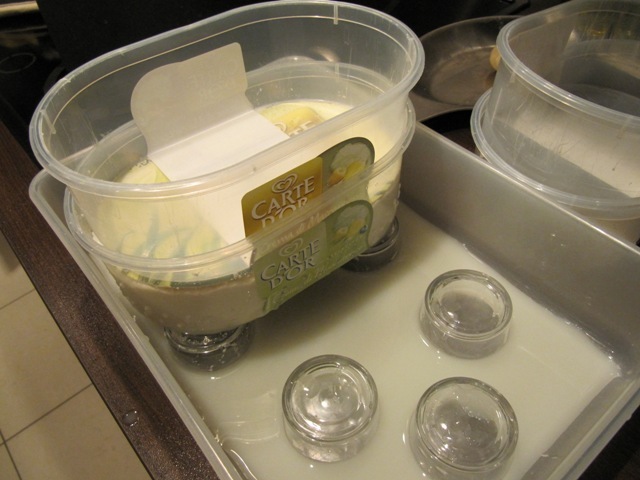 Claro, con 4 litros de leche y ya usando la cuajada principal para hacer queso blanco, lo que va a salir es muy poquita cantidad. Se separa el suero y se pone la cuajada en un colador muy fino (o, idealmente, en tela para queso o muselina) y se deja escurrir por unas 2 horas. Se sala al gusto y listo. 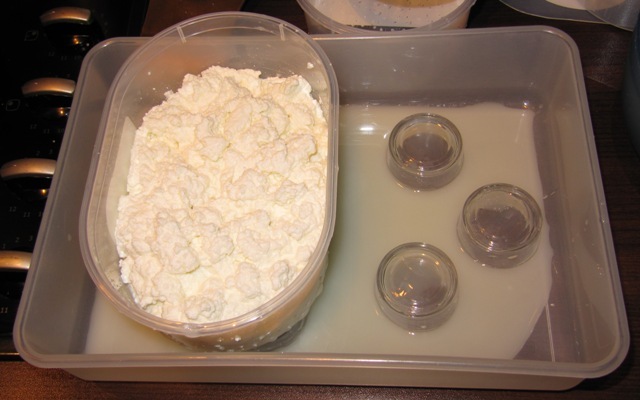 Si buscan en internet, la receta de ricotta o requesón que suelen dar es usualmente igual a la del queso blanco que les pongo arriba: calentar la leche, cortarla, separar la cuajada del suero. La gran diferencia es que la gente no prensa esa cuajada y es lo que usan para hacer la ricotta. Sólo la escurren bien. 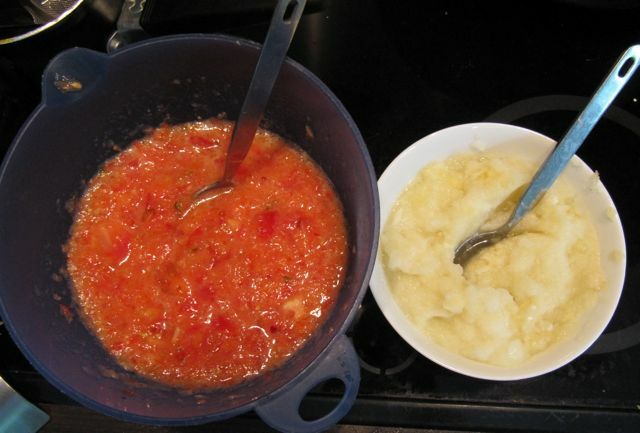 Pero originalmente, en Italia, ricotta quiere decir re-cocida, es decir, calentada dos veces, como en mi receta. La ricotta es un subproducto del proceso tradicional de hacer quesos. 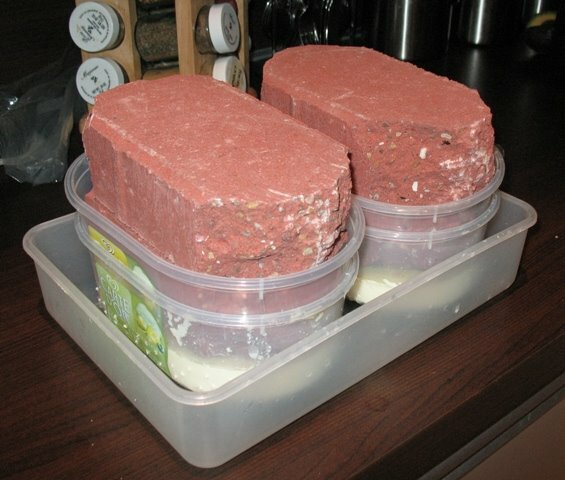 Cuando el queso esté listo y bien prensado, poner en salmuera por 12 horas. Luego, escurrir bien (12 horas por cada lado, para que se seque por completo). 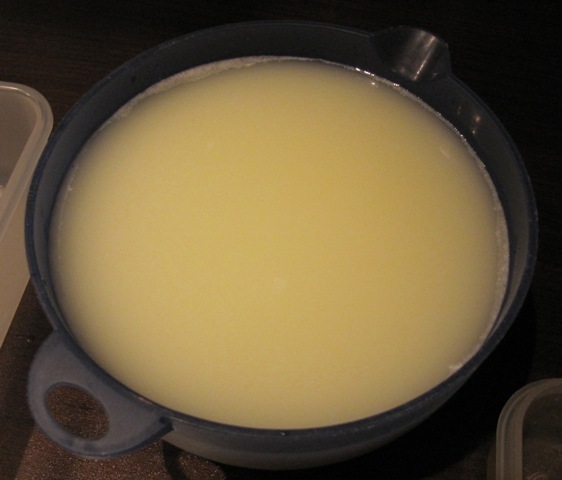 Cubrir todo el queso escurrido con una capita de aceite (de girasol, de oliva, el que gusten). Luego forrarlo por ambos lados con borra de café completamente seca (café usado). Dejar en un sitio fresco, tapado con un pañito, e ir dándole vueltas todos los días. Mientras más tiempo se deje, más seco y duro (tipo parmesano) va a quedar el queso. Aquí les va otro plato venezolana que muestra el gusto criollo por mezclar lo dulce con lo salado, como en la torta de plátano o en el pastel de chucho. 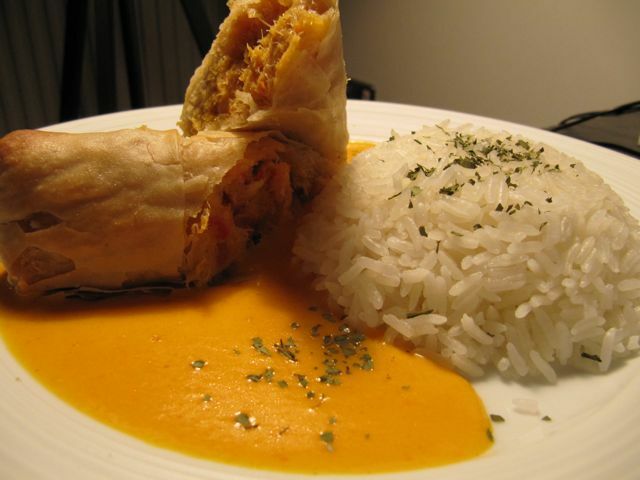 En este caso, el toque dulce no lo da el plátano, sino la cachapa de hoja, una especie de tamal hecho con granos de maíz / elote / choclo molido y cocidos en su propia hoja. Mi chalupa está basada en la receta de Scanonne, pero con bastantes modificaciones. Ésta es una versión un poco más rápida y especialmente adaptada para expatriados. La preparo con pechugas ya deshuesadas, en lugar de usar un pollo entero. 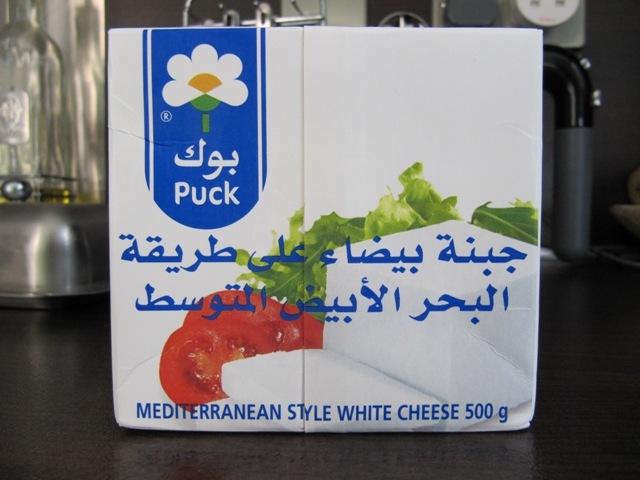 El delicioso e inimitable queso de mano se sustituye por una mezcla de mozzarella fresca y feta, tratando de conseguir tanto textura como sabor. Y las tradicionales cachapas de hoja se sustituyen por una cachapa gruesa hecha con masa de bolsita. Los puristas se retorcerán del disgusto, pero para los que vivimos lejos del Trópico, no hay demasiadas alternativas. 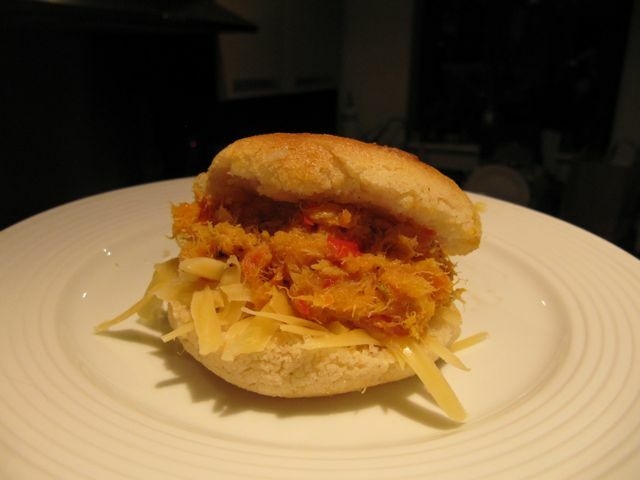 Si no consiguen la masa de cachapas en bolsita, lleguen hasta el final del post para una receta casera. 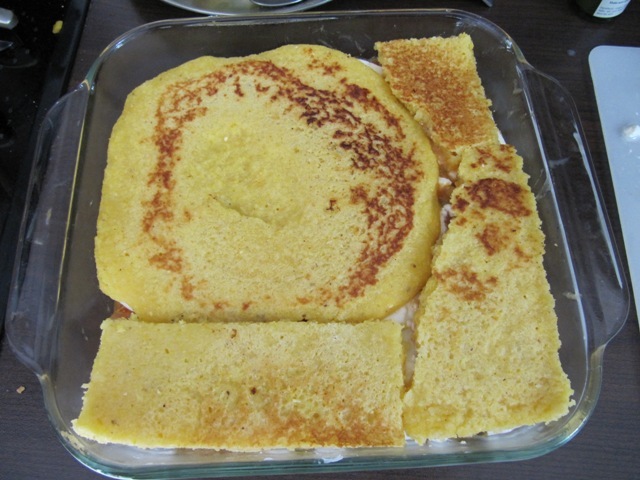 Aclaratoria para los no venezolanos: la diferencia entre la cachapa de hoja y la cachapa normal es que ésta última no se hierve envuelta en hojas de maíz, sino que se cocina sobre una plancha de hierro que llamamos budare (tipo el comal mexicano), igual que una panqueca gruesa, pero los ingredientes bases son los mismos. La chalupa es un plato completo que no requiere de acompañantes (tal vez alguna ensalada ligera, pero más nada). Lleva un poco de trabajo, pero se puede hacer por partes. Para el bautizo de mi sobrina Alessia, mi cuñada preparó varias bandejas y la gente alucinó. Si están nostálgicos por los sabores de casa, o si no son venezolanos pero andan con ganas de probar algo distinto, anímense y preparen la chalupa. En un caldero u olla amplia y grande, calentar un chorrito de aceite a fuego medio-alto y sofreír la cebolla, ajoporro, cebollín y ajo hasta que se pongan transparentes, entre 5-7 minutos, revolviendo frecuentemente para que no se vaya a quemar el sofrito. 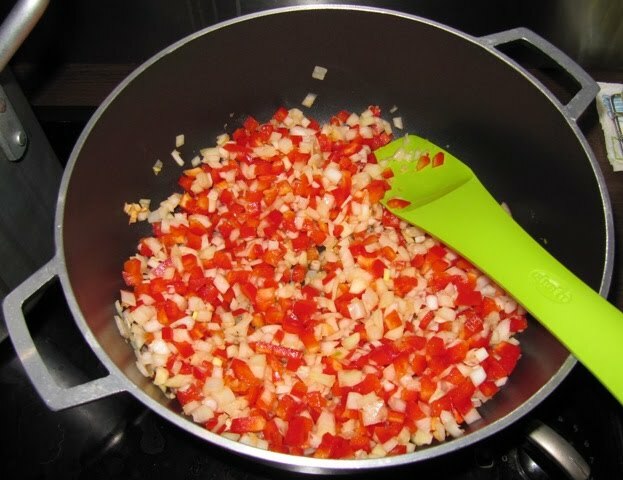 Agregar el pimentón, ají dulce, tomates, pasta (pasata o concentrado) de tomate, alcaparras y mostaza. Seguir cocinando y revolviendo por unos 6-8 minutos más, hasta que el tomate se deshaga y se merme un poco el líquido. Les recomiendo probar las alcaparras antes de incluirlas. Usualmente, las que vienen en salmuera hay que ponerlas en remojo con agua fría unos 10-15 minutos para eliminarles el exceso de sal. 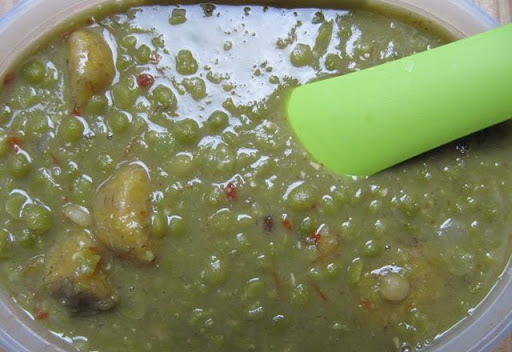 Tomen esto en cuenta antes de echarle el líquido y antes de echarle sal más adelante al sofrito. 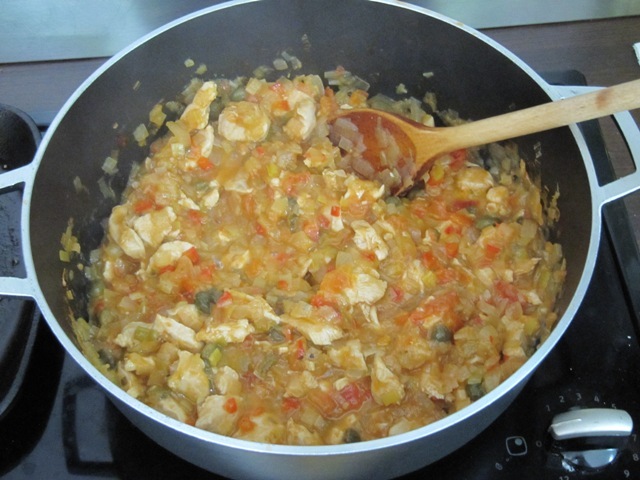 Lo bueno de usar un poquito del líquido en que vienen es que es gustoso y le da un toque ácido al guiso. 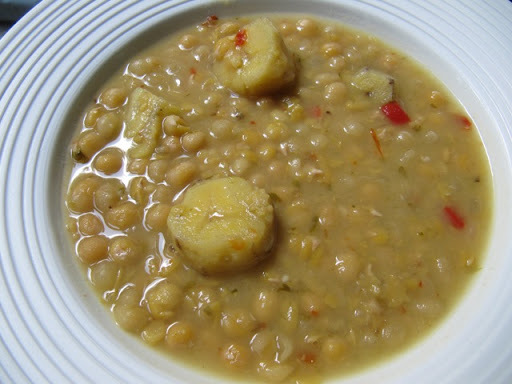 Cuando ya el sofrito se haya secado un poco y quede una especie de pasta, agregar el caldo (puede ser agua con un cubito de pollo), el vino dulce, la sal y la pimienta al gusto. 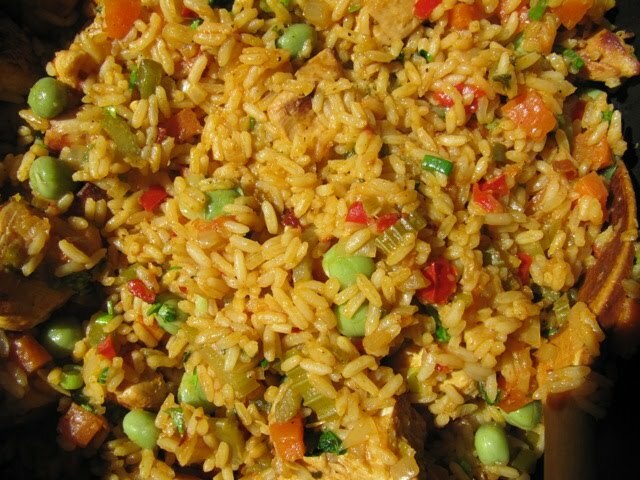 Sé que me pongo intensa con el tema de la sal, pero recuerden que las alcaparras son saladas, y que el caldo de pollo (si usan cubitos) ya lleva sal también. Un plato salado es irrecuperable, por eso es mejor ir probando y ajustando. Bajar la temperatura a fuego medio y cocer tapado por unos 10 minutos, revolviendo ocasionalmente. Agregar las tiras de pollo, tapar de nuevo y dejar otros 15-20 minutos, hasta que el pollo se cocine por completo. Revolver de vez en cuando. Destapar, subir la temperatura y dejar mermar un poco el líquido, revolviendo constantemente y cuidando que no se queme. Esto puede tardar otros 5 minutos, dependiendo de cuánto líquido haya. No hace falta evaporar todo el líquido, pero sí es buena idea que no quede como una sopa. Mientras se cocina el pollo, se pueden preparar las cachapas siguiendo las instrucciones del paquete. Usualmente piden agua, pero yo siempre las preparo con leche y con un huevo (previamente batido). No hace falta agregarles más azúcar. Es importante dejar la mezcla en reposo por unos 10-15 minutos, para que agarre consistencia bien espesa y las cachapas puedan quedar gruesas. Si logran darles forma cuadrada a las cachapas, mucho mejor, pero si no pueden no pasa nada. Luego se cortan en tiras. Si donde viven no consiguen la mezcla para cachapas y tienen un antojo a muerte, vayan hasta el final del post. 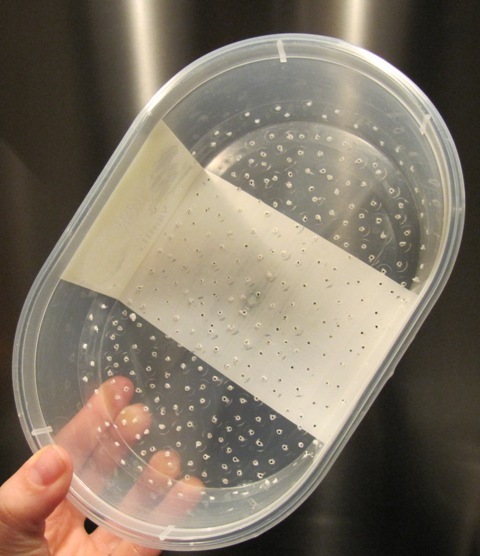 Engrasar un pyrex o molde para hornear de 20×20 cm (8×8″) y precalentar el horno a 175º C / 350º F.
Acomodar una capa de cachapas en el fondo, tratando de cubrir toda la base. Extender la mitad del guiso de pollo sobre la capa de cachapas, y cubrir con la mitad del queso. 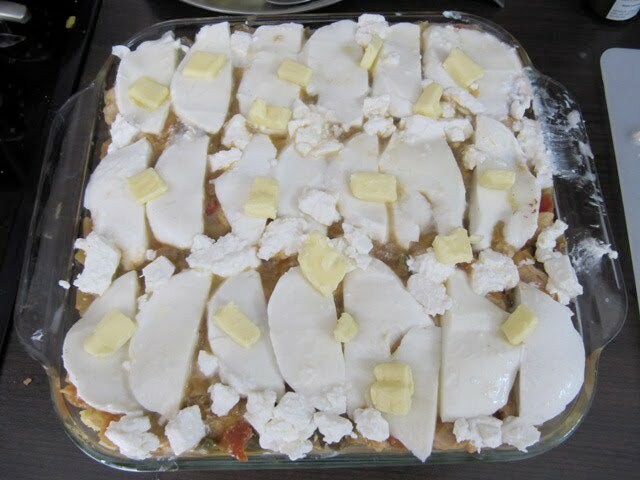 A falta de queso de mano, insustituible, se puede hacer una mezcla entre mozzarella fresca, cortada en rodajas finas, y algún queso tipo feta, que le dé el toque salado que le falta a la mozzarella. Si tampoco consiguen mozzarrella fresca, puede ser rallada. Poner otra capa de cachapas y presionar suavemente con la parte de atrás de una cuchara, de manera que todo lo que está abajo se compacte bien. Echar lo que queda de pollo, y coronar con lo que queda de queso. Distribuir los cubitos de mantequilla por encima. Meter al horno y hornear por 25 minutos. Cambiar a broil y dejar dorar el tope, pero sin llegar a quemar. No hay nada misterioso en esta receta. Sólo que el maíz en la cachapa tradicional se muele o “pila” en un pilón, una especie de mortero gigante. En estos tiempos de artefactos y adminículos eléctricos, podemos usar una licuadora y listo. 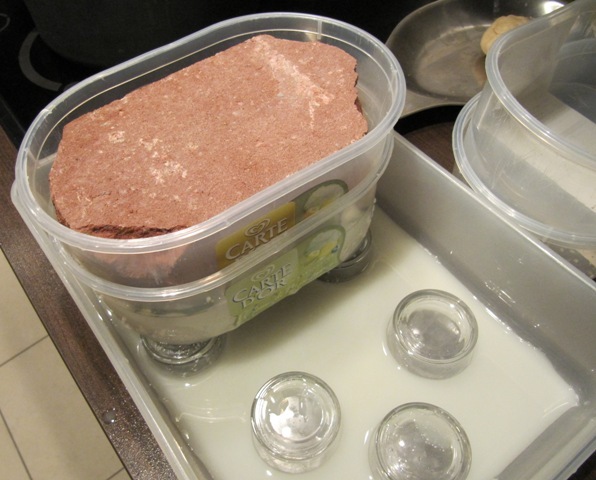 Para los gastrolectores no venezolanos que se aventuren a prepararlas, las cachapas tradicionales se comen con queso blanco fresco. Escoger mazorcas tiernas, quitarles todas las hojas, hilos e impurezas y desgranarlas usando un cuchillo afilado, pasándola al raz de la tusa (el corazón del maíz) pero sin llegar a cortarla. Esta advertencia es más que obvia, pero igual vale la pena reiterar: tengan cuidado porque el maíz puede ser resbaloso. Siempre pasen el cuchillo en un movimiento del cuerpo hacia afuera, JAMÁS hacia el cuerpo. Traten de cortar sólo los granos, no la tusa, que es dura y no tiene sabor. Poner todos los granos en una licuadora, junto con la sal, parte del azúcar y el huevo, y empezar a licuar. Ir agregando el agua poco a poco, hasta conseguir una pasta espesa. En inglés, el punto justo se llama “dropping consistency“, es decir, que esté espesa, pero suficientemente líquida como para no quedarse pegada a una cuchara volteada. Mientras más licúen, más fina queda la pasta, pero si quieren unas cachapas con un feeling más tradicional, déjenlas con cierta textura. Les sugiero que prueben la mezcla antes de poner toda el azúcar, porque a veces el maíz ya es bastante dulce y no requiere tanta. Esto tiene que ver con el tipo de maíz que se utilice. En Venezuela y en México, hasta donde sé, este tipo de platos se hace con un maíz mucho más duro y menos dulce que, por ejemplo, el que suele conseguirse en EE.UU. o en Europa, ese maíz súper amarillo y dulzón que venden en Friday’s y afines. Dependiendo de esto, van a necesitar más o menos agua y azúcar. Por eso las medidas son sólo sugerencias. Una vez que tengan lista la mezcla, dejarla reposar por 10-15 minutos. Calentar a fuego alto un budare, comal, plancha de hierro o sartén de fondo grueso. Cuando ya esté humeante, bajar el fuego a medio-bajo y engrasar un poco (con aceite de maíz o girasol es mejor que con mantequilla, que se quema muy rápido). Recuerden que las cachapas no son fritas, sino a la plancha, así que sólo basta con engrasar lo suficiente como para que no se peguen. Usando un cucharón de sopa, echar la masa en el centro del budare y extender con la parte de atrás de la cuchara. El grosor depende del gusto personal, pero no las hagan muy finas para que no se partan al voltearlas. Si las van a usar para chalupas, es preferible hacerlas un poco más gruesas. El tiempo de cocción varía dependiendo del grosor del budare o plancha que usen, y del grosor de la cachapa en sí. Tal vez entre 2-4 minutos por lado sea suficiente. Usar una espátula gruesa para voltear, preferiblemente en un movimiento rápido, y terminar de cocinar por el otro lado. 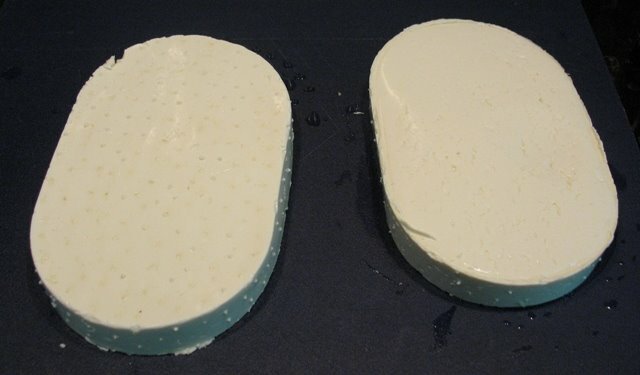 Si las van a comer solas, no en la chalupa, entonces poner una buena rebanada de algún queso blanco fresco (que se derrita) en una mitad de la cachapa, doblar la otra mitad y dejar en el budare hasta que el queso se derrita.